I chuckle a bit when people (even my own family) assume that we, as a vegan family, live on salads. How do you stay warm and grow with leaves? 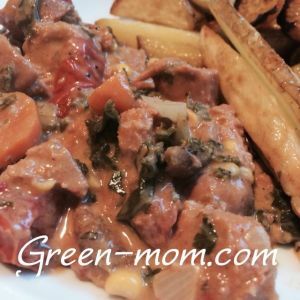 Well, as a mom of a vegan family and a huge foodie, I can tell you that I LOVE hearty and warms stews, and that’s what keeps us warm in the fall. I try to eat seasonally as much as possible and love making stews from all kinds of local produce. Right now, we have lots of root vegetables and mushrooms available, so here is a farmers’ market stew made for Sunday dinner. Heat oil in a large pot on medium heat, and sauté onion and a garlic for 2 minutes, until glossy but not brown. Add mushrooms and cook for 5 minutes. Add parsnip, tomatoes, and carrots, vegetable stock, kale, smoked paprika and agave nectar. Bring to a boil. Reduce to simmer for 20 minutes. Add salt and pepper to taste. Serve with baguette or cooked quinoa. Previous Chia: Salvia Hispanica — One of the World’s Healthiest Foods.